Objective Unlike several other national health agencies, French health authorities recommended that the newer direct oral anticoagulant (DOAC) agents only be prescribed as second choice for the treatment of newly diagnosed non-valvular atrial fibrillation (NVAF), with vitamin K antagonists (VKA) remaining the first choice. We investigated the patterns of use of DOACs versus VKA in the treatment of NVAF in France over the first 5 years of DOAC availability. We also identified the changes in patient characteristics of those who initiated DOAC treatment over this time period. Methods Based on the French National Health Administrative Database, we constituted a population-based cohort of all patients who were newly treated for NVAF between January 2011 and December 2015. Trends in drug use were described as the percentage of patients initiating each drug at the time of treatment initiation. A multivariate analysis using logistic regression model was performed to identify independent sociodemographic and clinical predictors of initial anticoagulant choice. Results The cohort comprised 814 446 patients who had received a new anticoagulant treatment for NVAF. The proportion of patients using DOACs as initial anticoagulant therapy reached 54% 3 months after the Health Ministry approved the reimbursement of dabigatran for NVAF, and 61% by the end of 2015, versus VKA use. In the multivariate analysis, we found that DOAC initiators were younger and healthier overall than VKA initiators, and this tendency was reinforced over the 2011–2014 period. DOACs were more frequently prescribed by cardiologists in 2012 and after (adjusted OR in 2012: 2.47; 95% CI 2.40 to 2.54). Conclusion Despite recommendations from health authorities, DOACs have been rapidly and massively adopted as initial therapy for NVAF in France. Observational studies should account for the fact that patients selected to initiate DOAC treatment are healthier overall, as failure to do so may bias the risk–benefit assessment of DOACs. With a source database covering 66 million inhabitants and exhaustive information on anticoagulant deliveries in France, our study is the largest to report penetration of direct oral anticoagulants (DOACs) on the market. The extensive size of the cohort comprising 814 446 individuals provides reliable information even for the most recent DOAC available at the time of the study, apixaban. The administrative database used does not include clinical results nor does it include outpatients’ diagnosis codes. To account for outpatients, we based our definition of non-valvular atrial fibrillation (NVAF) on drug dispensation, using the most likely treatment scheme for NVAF. We conducted sensitivity analyses to ensure that our results are consistent. In France, the direct thrombin inhibitor dabigatran was the first DOAC to be approved for the primary prevention of venous thromboembolism in orthopaedic surgery (in 2008) and stroke in NVAF (in 2011). Reimbursement of dabigatran for the treatment of NVAF was approved in July 2012. Two new oral direct factor Xa inhibitors, rivaroxaban and apixaban, were made available for patients with NVAF in September 2012 and January 2014, respectively. Given the initial lack of specific antidotes and of data on these drugs’ efficacy and safety in real life, French health authorities recommended that VKAs remain the standard therapy. They also recommended that DOACs be offered as an alternative therapy only to patients with low adherence to VKAs or unstable international normalised ratios (INRs) on VKAs.17 To date, it is not clear how the expectations of clinicians and the recommendations of health authorities have impacted the choice of anticoagulant for newly treated patients with NVAF. Nor is it clear how patients’ characteristics have influenced treatment choice. In view of the above, we conducted a study in the French National Health administrative database. 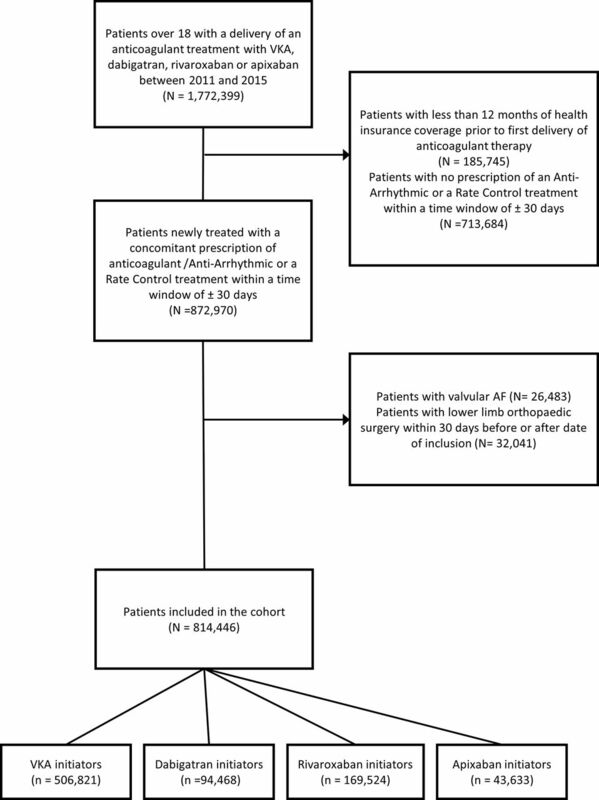 This study based on claims data, aimed to identify the initial oral anticoagulant therapy used in a cohort of patients newly diagnosed with NVAF for the prevention of stroke and systemic thromboembolism. It also sought to describe changes in the characteristics of patients who initiated treatment during the first 5 years of DOAC availability in France. In France, drugs are available only in pharmacies, and a medical prescription is required to obtain anticoagulant drugs. All reimbursement claims for prescriptions processed and filled in pharmacies are submitted to the NHIS via a single electronic system. This drug delivery database is linked to the hospital discharge database through a unique personal identifier allocated to every individual. The second database provides medical information on all patients discharged from hospitals, along with associated 10th version of International Classification of Diseases diagnosis codes. However, no clinical diagnosis is provided in this database for consultations by health professionals in an ambulatory care setting. We defined a cohort of all patients 18 years and older who were newly treated for NVAF between 1 January 2011 and 31 December 2015. Cohort entry was defined by the delivery of anticoagulant therapy (VKA or DOAC) combined with either an antiarrhythmic agent (flecainide, propafenone, amiodarone, quinidine, disopyramide or sotalol) or a rate control treatment (beta-blocker, calcium channel blockers—verapamil and diltiazem—or digoxin) within a time window of +/−30 days. The date of cohort entry was the latest date of delivery of either drug, within the 30-day window. We excluded patients with less than 1 year of data available in the database before cohort entry, as well as patients who had received anticoagulant treatment or had a history of cardiac valvular replacement in the 12 months before inclusion. Therefore, the anticoagulant therapy received at cohort inclusion corresponded to a new anticoagulant therapy. Lastly, we excluded patients who had undergone lower limb orthopaedic surgery within +/−30 days of inclusion. We identified patients’ exposure to initial anticoagulant treatment. We compared patients initiating VKA treatment—acenocoumarol, fluindione, warfarin (the three most commonly used VKAs in France)—to patients receiving any of the three DOACs available during the study period (dabigatran, rivaroxaban or apixaban). Descriptive statistics were computed for continuous data (mean,+/− SD or median and range) and for categorical data (frequency and proportion). Trends in drugs use were described as the number of new patients treated each month and as the percentage of each anticoagulant prescribed at the time of treatment initiation. Patients’ characteristics were described according to initial anticoagulant therapy received. In bivariate comparisons, the characteristics of patients and prescribers were compared according to the type of anticoagulant, using a t-test for continuous variables and a χ2 test for categorical variables. To identify independent predictors of initial anticoagulant choice, we performed a multivariate analysis using five logistic regression models, one for each calendar year of anticoagulant initiation. The model included all the variables that were associated with a p value <0.20 in the bivariate comparisons. These variables were selected using a backward selection approach. Further, we defined two other cohorts for the sensitivity analyses: (1) one cohort was defined more restrictively—it included patients who were newly treated with an anticoagulant combined with an antiarrhythmic agent or a rate control treatment other than beta-blocker agents within a time window of +/-30 days; (2) the other cohort was defined according to broader inclusion criteria—it comprised all patients newly treated with an anticoagulant, regardless of other potential concomitant therapies. To assess the impact of timeline events on the uptake process (ie, market authorisation of each drug, reimbursement approval/downgrade and security warnings from national health agency), we fitted a segmented regression model adjusted on: (1) drug coded into four categories (VKA, dabigatran, rivaroxaban and apixaban); (2) time (linear and square terms) and (3) each timeline event. A timeline event was coded as a dichotomous variable valued 0 before the event and 1 after. All these covariates were included in a primary model, then a backward selection procedure was applied to select covariates associated at a significant level (p<0.05). To evaluate the trends and the impact of timeline events on each drug, we entered an interaction term for each drug and other covariates (time and timeline events). Statistical significance was set at 0.05. All p values were two sided. All statistical analyses were performed using SAS V.9.4 (SAS institute). In France, 1 772 399 individuals were delivered a prescription for either a VKA or a DOAC between 1 January 2011 and 31 December 2015 (figure 1). Out of this sample, we identified 872 970 individuals who received a new prescription for an anticoagulant (VKA or DOAC) combined with a prescription for an antiarrhythmic agent or a rate control treatment within a time window of +/−30 days. Ultimately, the cohort comprised 814 446 patients newly treated for NVAF: 506 821 subjects initiated VKA, 94 468 dabigatran, 169 524 rivaroxaban and 43 633 apixaban. Flowchart describing cohort constitution. AF, atrial fibrillation ; VKA, vitamin K antagonist. 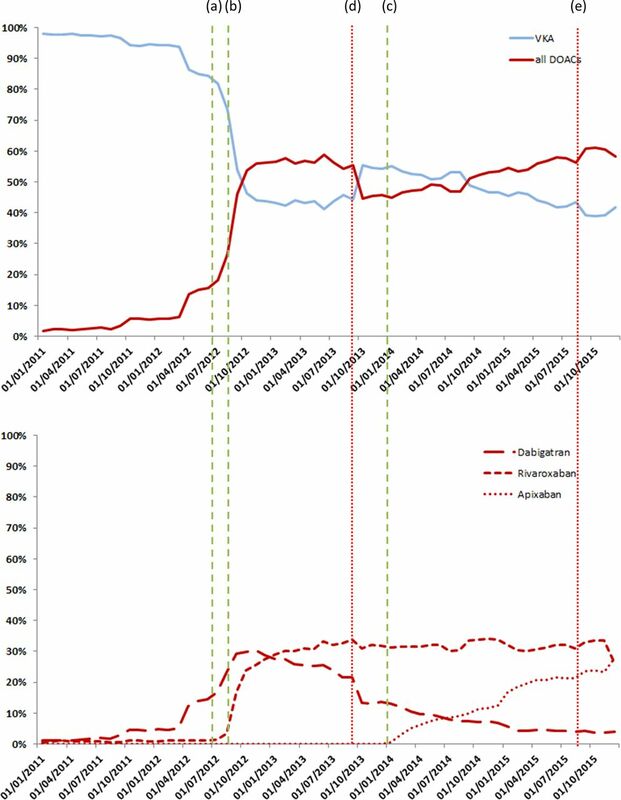 Figure 2 illustrates the percentages of patients initiating one of the different anticoagulant treatments over the study period. A sharp rise in DOAC use was observed starting in mid-2012. As of October 2012, DOACs were used more frequently than VKAs as initial anticoagulant therapy, representing 54% of all anticoagulant prescriptions (30% for dabigatran and 24% for rivaroxaban). In the last quarter of 2015, this percentage reached 61% (4% for dabigatran, 34% for rivaroxaban and 24% for apixaban). The proportion of patients initiating dabigatran began to decline 6 months after reimbursement was approved and even more so after October 2013. Rivaroxaban use increased sharply as early as September 2012. This drug was the most frequently initiated DOAC in early 2013, and it remained so until December 2015, when it was surpassed by apixaban (26% vs 28% in December 2015). Time trends in the prescription of anticoagulants in newly treated patients with atrial fibrilation between 2011 and 2015 in France (n=814 446). Significant change points in trends identified a segmented regression model. (a) Dabigatran reimbursement approval, (b) rivaroxaban reimbursement approval (c) and apixaban reimbursement approval, (d) security warning (risks of bleeding haemorrhages) from the national health agency, (e) downgrade of dabigatran reimbursement. DOACs, direct oral anticoagulants; VKA, vitamin K antagonist. Figure 2 illustrates the percentages of patients initiating one of the different anticoagulant treatments over the study period. The segmented regression model identified five significant change points. The two first change points (lines a and b in figure 2) corresponded to a sharp rise in DOAC initiation in July 2012 and in September 2012, corresponding respectively to dabigatran and rivaroxaban reimbursement approval time. As of October 2012, DOACs were used more frequently than VKAs as initial anticoagulant therapy, representing 54% of all anticoagulant prescriptions (30% for dabigatran and 24% for rivaroxaban). The third change point identified was in September 2013 (line d, figure 2) with a significant decrease in the use of DOACs at the time security warnings were issued by the French health authorities. From January 2014 (fourth change point—line c on figure 2), DOACs initiation increased again, corresponding to the time point where apixaban received reimbursement approval. A final significant change point (line e) was identified in September 2015 and was linked to a reduction in dabigatran reimbursement. In December 2015, apixaban was the most prescribed DOAC (28% vs 26% for rivaroxaban). The mean age of newly treated patients was 74.9 (SD: 11.7), and 50.2% of patients were male (table 1). Most subjects were treated for high blood pressure (94.4%), and 22.2% were treated for diabetes. Patients who received DOACs had less comorbidities and were on average younger than those who were prescribed VKAs (73.8 years (SD: 11.5) vs 75.6 years (SD: 11.9) p<0.0001). General practitioners prescribed VKAs (67.5%) more frequently than DOACs (32.5%) as initial anticoagulant therapy, whereas cardiologist favoured DOACs (51.2%). Patients receiving apixaban were older than those receiving other DOACs (76.2 vs 72.9 for rivaroxaban and 74.1 for dabigatran). They also had more comorbidities, such as high blood pressure and heart or renal failure (table 1). Patients with lower HAS-BLED or lower CHA2DS2-VASc scores were more likely to initiate DOACs (figure 3). 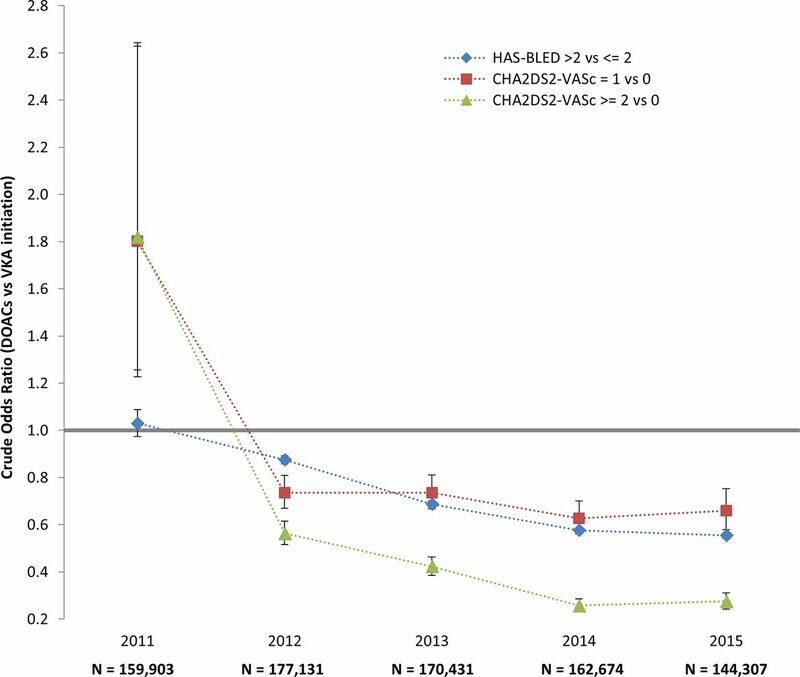 HAS-BLED and CHA2DS2-VASc scores associated with DOAC vs VKA initiation according to year of therapy initiation. Crude ORs and 95% CI. DOAC, direct oral anticoagulant ; VKA, vitamin K antagonist. The characteristics and associated treatments of DOAC initiators as compared with VKA initiators changed over the 5-year period (table 2). Older subjects (>=75 years) were less likely to initiate DOAC treatment than VKA treatment. The adjusted OR decreased from 0.86 in 2011 (95% CI 0.80 to 0.92) to 0.62 in 2014 (95% CI 0.61 to 0.64). Overall, patients with comorbidities—especially renal failure—were less likely to receive DOAC treatment, and this negative association was reinforced over the study period (adjusted OR for 2014: 0.22; 95% CI 0.21 to 0.23). The negative association was not reinforced in 2015, likely due the fact that a larger proportion of patients received apixaban. However, because apixaban was only available at the end of the study period, further data are needed to confirm this hypothesis. Patients with a history of bleeding prior to cohort entry were less likely to receive DOAC treatment (adjusted OR for 2015: 0.56; 95% CI 0.53 to 0.59). Since 2012, cardiologists have been strongly associated with initial prescription of DOACs, after accounting the patients’ characteristics. The sensitivity analyses conducted for the two other cohorts provided similar results: a rapid increase in the use of DOAC over time, and a healthier profile of patients receiving DOACs compared with those receiving VKAs (see online supplementary material cohort 1 and 2). Less than 6 months after reimbursement was approved, DOACs became the most frequently prescribed initial anticoagulant therapy for NVAF in France. Starting in the third quarter of 2012, DOACs were delivered to over 60% of all patients newly treated for NVAF. Dabigatran, rivaroxaban and, in late 2015, apixaban were used one after the other as the most frequent initial DOAC therapy for NVAF. The proportion of dabigatran initiators declined largely after 2013. DOAC initiators were younger and healthier than VKA users, and this tendency was reinforced over time. The use of DOACs varied over time depending on the availability of new drugs and on the national recommendations and safety warnings in place. National trends in anticoagulant sales volumes have also been reported in other countries, revealing an important upsurge in DOAC use.24–26 Most studies based on registries or cohorts of patients with NVAF have reported dabigatran use rates ranging from 5% to 25%, which is lower than what we found in our study.27–30 However, in the USA, Desai et al have reported an increase in DOAC use for the 2010–2013 period which is similar to the one we observed, with a peak of 62% of patients initiating DOAC treatment among a cohort of anticoagulant initiators.31 These common trends in results observed are surprising given the differences in populations, health systems, drug coverage and, most importantly, clinical recommendations on the use of DOACs for the treatment of NVAF between countries. Indeed, in France, health authorities do not recommend DOACs as initial anticoagulant therapy, unless the patient has poor adherence to VKAs or unless biological monitoring of VKA treatment is difficult.17 However, physicians are still free to opt for any of the available treatment and their personal beliefs on efficacy and safety influences their choices. Our results indicate that the characteristics of patients who initiated treatment with DOACs rather than VKAs evolved over the first few years of drug commercialisation. In the first year, we observed a selection process with healthier patients using DOACs more frequently than VKAs as initial therapy.31 This tendency was reinforced as DOAC initiators became healthier over time. It may reflect the evolution of the perception of efficacy and safety of these new drugs by physicians. The prescription of DOACs to healthier patients is an issue that needs to be addressed, as these molecules may offer higher risk patients greater benefits than VKAs,35 and because their cost-effectiveness depends on the severity of patients’ condition.36 Observational studies that aim to evaluate the risks and benefits associated with DOACs as well as cost-effectiveness studies should carefully account for the fact that patients selected to initiate DOAC treatment are healthier overall, as well as for the selection of patients on the different types of DOACs.37 Failure to do so may lead to underestimating the potential risks associated with DOACs in real-life studies. The fact that DOAC initiation is less frequent among patients with comorbidities may result from a warning issued by different health agencies such as in France, Europe or USA.35 This tendency seems to be linked to the diminishing use of dabigatran observed at the end of 2013, when the French medicine safety agency released warnings on bleeding risks associated with the drug.38–40 At the time, French health authorities informed health professionals that DOACs are not recommended as initial therapy for NVAF, unless the patient has poor adherence to VKAs or unless biological monitoring of VKA treatment is difficult. However, while these recommendations were followed by a temporary decrease in DOAC use, a few months later, DOACs were once again the most frequently prescribed anticoagulants for patients newly treated for NVAF. Our study has several strengths. The source database covers 66 million inhabitants and nearly 99% of the French population, which means that our findings are independent of individual health coverage. Moreover, we had access to exhaustive information on anticoagulant delivery because these treatments are delivered on prescription alone. As a result, our study is the largest to report penetration of DOACs on the market (particularly in the case of apixaban, which is the most recent DOAC available) and to describe variations in the characteristics of patients over time. Nevertheless, some limitations must also be acknowledged. The NHIS administrative database does not include clinical or biological results nor does it include outpatients’ diagnosis codes. To capture outpatient diagnosis of AF, we based our definition of NVAF on drug dispensation, using the most likely treatment scheme for NVAF. Insofar as the results of our sensitivity analyses are consistent, we can be confident that our findings regarding the choice of the initial therapy and the patients’ characteristics are not too sensitive to the definition of NVAF. Moreover, 69% of patients who were hospitalised during follow-up had a diagnostic code of NVAF in the hospital discharge database (data not shown). We did not use long duration diseases codes to define AF as these codes have various limitation, for example, their use has been shown to differ between the insurance schemes included in the database,41 and there was an important discrepancy between them and hospital discharge codes. These long duration disease codes were only used to define some covariates but only in combination with drugs delivery and/or hospital codes. We did not exclude patients with deep vein thrombosis or pulmonary embolism at inclusion. They represented 4.4% of the study sample. We conducted a sensitivity analysis excluding these patients and obtained similar results (data not shown). Another limitation of our study is due to the 2015 data that may be partially incomplete. Indeed, for patients who do not have their NHIS card and attend a pharmacy that is not their regular pharmacy—a paper reimbursement form may be issued. The data are then recorded when the paper form is sent to the NHIS and integrated later in the database. When the 2015 data were made available, paper claims were likely to have not been all included. However, this changes the total number of users but not the proportion of users of the different drugs. The rapid and massive adoption of DOACs as initial therapy for NVAF will impact treatment expenditures because of the important increase in costs associated with these new drugs (in the USA, these costs accounted for more than 90% of insurer spending on anticoagulants in 2014).31 Future observational studies should carefully account for the fact that patients selected to initiate DOAC treatment are healthier overall, and that this tendency is reinforced over the first few years of drug commercialisation. Failure to do so may bias the risk–benefit assessment of DOACs. We thank the Caisse National de l’Assurance Maladie des Travailleurs Salariés (CNAMTS) and the Institut des Données de Santé (IDS) for their assistance in obtaining the study database. We personally thank Ms Valérie EDEL from the IDS, as well as Mr Laurent DUCHET and Mr Medhi GABBAS from the department in charge of the SNIIRAM DATA at CNAM-TS. We are indebted to Arianne Dorval for proofreading the English manuscript. C Renoux is the recipient of a Chercheur-Boursier award from the Fonds de la recherche du Québe-Santé (FRQ-S). SS is the recipient of the James McGill Chair. Haute Autorité de Santé. Fibrillation auriculaire non valvulaire: Quelle place pour les anticoagulants oraux non antivitamine K:apixaban (Eliquis®), dabigatran (Pradaxa®) et rivaroxaban (Xarelto®, 2013. http://www.has-sante.fr/portail/upload/docs/application/pdf/ 2013-07/fs_bum_naco_v5.pdf. Agence Nationale de Sécurité du Médicament et des produits de santé. Nouveaux anticoagulants oraux Eliquis (apixaban), Pradaxa (dabigatran), Xarelto (rivaroxaban): mise en garde sur les facteurs de risques hémorragiques - Lettre aux professionnels de santé, 2013. Haute Autorité de Santé. Les anticoagulants oraux antivitamine K restent la référence dans la fibrillation auriculaire non valvulaire - Communiqué de presse, 2013. Haute Autorité de Santé. Point sur l’utilisation des nouveaux anticoagulants oraux - Communiqué de Presse. 2013 http://www.has-sante.fr/portail/jcms/c_1700943/fr/point-sur-l-utilisation-des-nouveaux-anticoagulants-oraux. Contributors LH, XR, CF designed the study. All authors have contributed substantially to the interpretation of results. In addition, LH and AB drafted the article; CF conducted the statistical analysis; CF, CR, SL, LB, SS, OM and XR provided critical revision of the manuscript for important intellectual content. All authors had full access to all of the data (including statistical reports and tables) in the study and can take responsibility for the integrity of the data and the accuracy of the data analysis. All authors approved the version to be published. Funding This research was supported by a 2012 research grant from the Agence Nationale de Sécurité du Médicament (ANSM). Competing interests SS has participated in advisory board meetings and received research grants from Bayer, Boehringer Ingelheim, Bristol-Myers-Squibb and Novartis. These activities are conducted outside this submitted study. All other coauthors have no conflict of interest. Ethics approval The study was approved by the French National Institute of Data and by the National Commission for Data Protection and Liberties (CNIL-France: authorisation number: 1637014). Data sharing statement No additional data are available directly from the authors. The datasource of the study is the French National Health Insurance. Data ara available from the Caisse National de l’Assurance Maladie des Travailleurs Salariés (CNAMTS) for academic research.